← Kidney APPEARANCE and Kidney REFLUX are Different. Sometimes I have to remember that Colten’s adventures include not just his medical experiences but also the normal child development progressions! This week, our EarlyOn PT, April (we really like her – she is great! ), worked with Colten on starting to feel his body roll over, sit up, and grab at toys. He isn’t necessarily behind in these stages – a little delayed on grabbing at toys because his fists were clenched for so long due to the hydrocephalus and still stay clenched quite a bit, but rolling over he still has some time to work towards. Usually by about 6 months on average is when babies tend to roll back to belly, with belly to back coming sooner. Sitting up unassisted usually occurs around that 6 month mark as well. Seeing that Colten wasn’t yet grabbing for any toys, April inquired as to what all Colten was getting exposed to holding or grabbing at these days. I told her that the only thing he seemed to grab and pull up to his mouth to explore was if I left a burp rag on his belly or in front of him on the Bumbo. He seemed to not have any interest in any rattle, ring or other toy we showed him. April suggested a crinkly toy and I dug a book out of the boys’ book basket that has touch-and-feel pages of animals as well as a crinkly front cover. Well that was all Colten needed! He loved it. He enjoyed scrunching it up, eating it and even enjoyed some tummy time with the book. Time to go digging for some more scrunchy toys! Speaking of tummy time, we are not big pushers of it so this is really the first week that Colten has had significant tummy time and he’s already four months old. Most of his tummy time is actually tummy-to-tummy time on Richard or me, as we lean back on the couch with him. While tummy time is something that helps babies develop neck strength and use both gross and fine motor skills, I find it funny that both the AAP and Mayo Clinic push the fact that tummy time helps avoid a flat spot from babies laying on their backs too much – which they also both say is not a developmental concern, just a physical appearance “problem”. So this has never been as big of a concern for us since we actually tend to wear our kids in wraps and carriers as opposed to leaving them laying on the floor – babywearing also avoids misshapen heads! And even in the carriers, as Colten stretches himself upgright when looking around, he will push with his arms against me to move his body, strengthening his arms. The upright position of the carriers also helps build neck strength, just as tummy time would (and of course back-lying does not). Also, since tummy time does put a lot of strain on the spine, I was particularly cautious of it with Colten due to the trauma to his spine from the spina bifida myelomeningocele and repair. So to be honest, he really hasn’t spent more than 1 minute at a time on his belly until the last two weeks. The reassuring thing for me was that as he’s on his belly now, he’s totally content and happy (NOT the case weeks ago!). 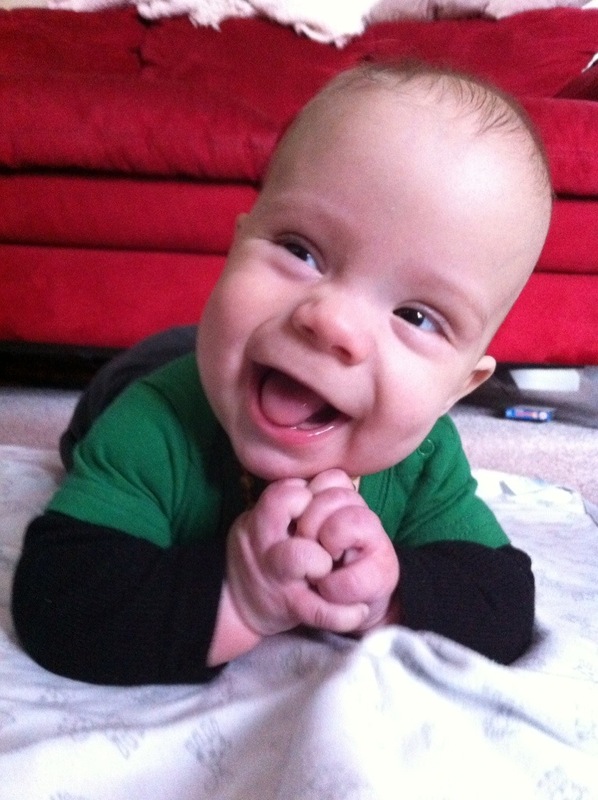 So I feel more comfortable that he is ready for tummy time. AND after just one little session of encouragement from April on rolling belly to back, Colten can do it on his own now when he’s done being on his belly. Another sign that he truly is ready for tummy time! This entry was tagged Infant development, myelomeningocele, physical therapy. Bookmark the permalink. What a handsome and happy little man! !